Summer is finally over for me. There are no more festivals and the weather has taken a turn for the worse, feeling pretty down really. I need to replace most of last years winter wardrobe because my old favourites don't fit anymore but winter coats and sturdy shoes cost a small fortune so I'm not looking forward to this. I'm trying to buy better, less often so some of my picks are a little on the expensive side but I'm hoping they will last for many winters to come. 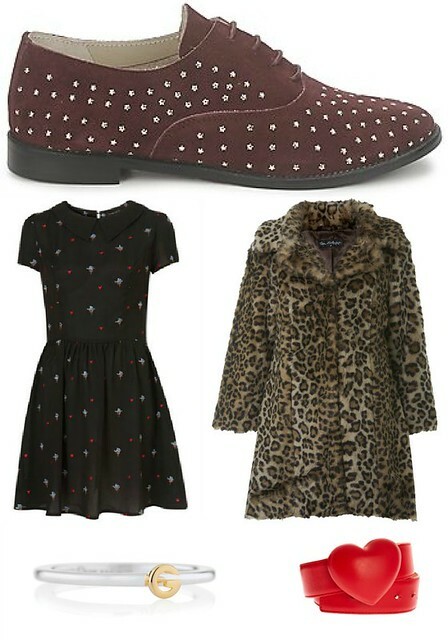 shoes: Low smart shoes, Meline I love the little star studs on these and berry colours are all over the high street at the moment. I'm looking for a really nice pair of lace up shoes and I think I've found the right pair. You need lots of layers in wet and cold Wales so I can wear little frilly socks with and stay warm. Dress: Floral embroidered flippy dress from Topshop. I've actually just ordered this dress and can't wait for it to arrive. It looked so pretty in store and it will be great for work with a cardigan and flats or great for a night in the pub with some heels. Wish I waited one more day to order this though because Unidays have 20% discount codes for Topshop so I could have made double the student saving. Coat : Leopard print faux fur from Miss Selfridge. I've been on the hunt for a leopard coat for ages. I can't get the right length, colour or collar but this looks just right. Going to have one last look on eBay and at some second hand shops for something similar before I pay out £89 for this one. Ring: G Alpha ring from Daisy. I saw this ring on Charlene's blog and fell in love I'm allergic to most jewellery but this has a sterling silver band and gold letter which wont make me sore or turn green. At £37 it isn't cheap but Topshop rings are now about £8 and tarnish after a few wears. I think this would be one of those rings that I wear everyday so well worth the money. hadn't thought of that but something like a mac would be good! great wish list....has all the aspects of what I'm lusting after this winter....really lovely items!